Get the 411 on this handsome hardwood flooring option that’s currently enjoying a renaissance. When it comes to elaborate flooring, parquet reigns supreme. Constructed from small pieces of hardwood fitted together in geometric patterns, parquet flooring adds a dramatic design element to any room. 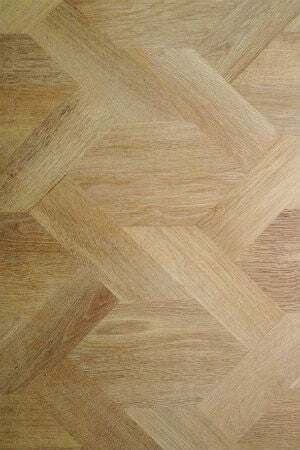 In the United States, parquet reached its popularity peak in the 1960s, and then, as with many boom trends, demand slowed. Recently, however, parquet flooring has shown signs of a comeback, due in part to new manufacturing techniques that offer consumers a wider range of wood species and motifs. So keep reading to learn about the parquet pros and cons, prices, installation, and maintenance to decide if this bold statement underfoot is right for you. Parquet comes from the French term “parquetry,” meaning “small compartment.” It originated in France in the 17th Century, where artisans created elaborate designs by cutting and fitting small geometric pieces of wood together, one at a time, and then gluing them to the floor. Because of the skill and time required, parquet floors were initially the province of wealthy households and public buildings. A few of the earliest specimens still exist—such as the Galerie d’Hercule at the Hôtel Lambert, Paris—and are considered works of art in their own right. While artisans can still piece together a custom parquet floor, the vast majority of modern parquet flooring comes in square tiles, featuring strips of hardwood bonded to a mesh or thin plywood base. Custom parquet is rarely found in residential homes today because it still requires individually cutting wood pieces and assembling them in puzzle-like fashion to form mosaics, mandalas, and other intricate designs. The few companies that specialize in custom parquet charge $20 to $45 per square foot or more, depending on the level of complexity. Parquet flooring tiles are the product of choice for homes today—and they’re do-it-yourself-friendly. An assortment of hardwoods, including oak, chestnut, ash, and walnut are popular in these tiles, and you can also find some exotic wood species and bamboo. Parquet flooring tiles sell by the carton, in 9-inch, 12-inch, and 18-inch squares. When installed by a homeowner, parquet flooring runs $3 to $5 per square foot. Professional installation of parquet tiles will raise the cost to around $7 to $10 per square foot. Before investing the time and money in parquet flooring, carefully consider the positive and negative aspects of this feature floor. • Variety, with dozens of complex patterns available. • The warm appeal of real wood. • Tile installation is DIY-friendly, with no nailing required. • Can be a challenge to refinish (see below). • Should not be installed below grade (in basements) due to common moisture issues. • Not suitable for high humidity areas, either, including bathrooms and laundry rooms. Many contractors and flooring professionals are adept at installing parquet tiles, but whether you choose to go with a pro or tackle the job yourself, the following pointers will give you an idea of what’s involved. Keep in mind that manufacturer specifications vary, so always follow the instructions enclosed in the carton of parquet flooring tiles. • Prep for installation. Parquet flooring should be installed on a stable substrate, such as a sturdy subfloor. The substrate should be dry and level. Remove baseboards prior to installation. • Let it acclimate. Parquet is real wood and needs to acclimate to the room where it will be laid to reduce the risk of gaps developing later between the strips. The standard acclimation time for hardwood is two weeks. Simply set the cartons in the room; no need to take the tiles out. The wood strips may move imperceptibly during this time as they adjust to temperature and humidity. • Figure your layout carefully. 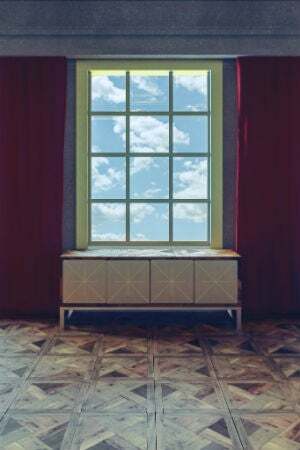 Parquet tile designs repeat with every subsequent tile, and if the rows are not perfectly straight, or not aligned precisely with the walls, the end result will be amateurish. Not all rooms are perfectly square, and you’ll need to take that into consideration when creating a layout. Tiles come with detailed instructions on how to develop a floor layout. Follow these directions to the letter for professional looking results. • Use the recommended materials and tools. The recommended tools and materials are designed to give you the best results, so don’t just wing it with what’s at hand. Not only can the type of adhesive vary depending on the brand of tile, the manufacturer will often recommend a trowel with specific size notches. • Cut with a jigsaw, not a circular saw. While it’s standard practice to cut other types of wood flooring with a circular saw, parquet often comes with small wires embedded in the wood strips. These wires can get tangled in the spinning blade of a circular saw, creating a hazard, ruining the tile, and potentially damaging the saw. The up-and-down motion of a jigsaw cuts right through the wood and wire without problems. Protect your investment with the right care and your parquet floors will look beautiful for years. • For daily care, dry mop the floor with a microfiber or wool dust mop to remove dust and lightweight crumbs. • Wipe up wet spills promptly with absorbent paper towels. Use a damp washcloth or sponge on sticky stains. • Vacuum once a week, or as needed, using a brush attachment. • Use a cleaning product designed for wood floors, once a month, or as needed, to maintain a bright, lustrous look. • Avoid wood furniture dusting products, which can make parquet floors dangerously slippery. • Do not use a steam mop. The heat and moisture can damage the finish and even swell the wood grain. • Do not apply floor wax or polishing products intended for vinyl or ceramic tile floors—they could damage the finish. • Put rugs in high traffic areas to protect your floor’s finish. • Use stick-on silicone or felt protectors under furniture legs to prevent scratches. 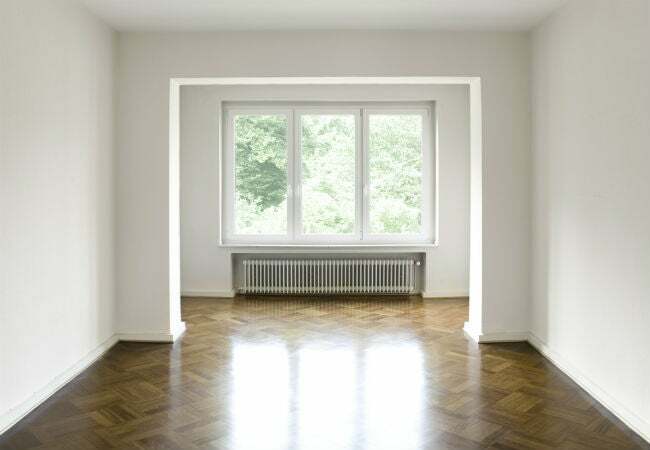 With care, your parquet floor should maintain its luster for 10 to 15 years, or longer. Over time, however, even the most well-kept wood floor can start to look a little dull, especially in high-traffic areas. When the surface coat wears thin, refinishing is an option, but it should probably be done by a wood flooring professional. Refinishing a parquet floor can be difficult because removing the old finish involves sanding, and wood should always be sanded with the direction of its grain to prevent cross-grain marks. Because a parquet floor features pieces of wood grain running in different directions, removing the old finish without damaging the surface of the wood beneath requires painstaking care.